Typically used for welding thin wall stainless steel from one side. Attaches to the backside of the weld area and supports the weld pool, keeps the argon gas surrounding the weld pool. Eliminates the need to back-purge. Provides a consistent high quality under bead profile. 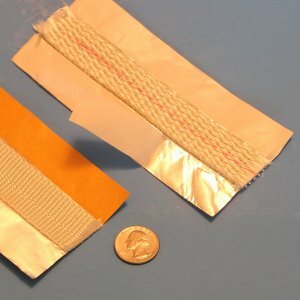 The most popular tape is 3" wide aluminum tape with adhesive strips on each side of a 1" wide woven tape strip in the middle. Supports single pass welding at currents up to 240 amps without change to the chemistry or metallurgy of the weld. Available in Light Duty (80 amp), Medium Duty (160 amp) and Heavy Duty (240 amp) ratings.